Recently, I opened my medicine cabinet and things started to fall out all over the sink. This was a sure sign that it was time to reevaluate where the space was actually going. 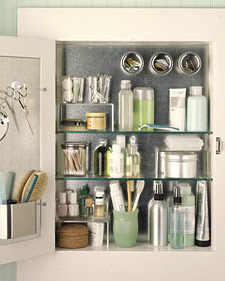 The most important thing to remember when cleaning out and reorganizing your cabinet is that you make it work for you. I found that most of my medicine cabinet was made up of "medicine." Instead of continuing this reactionary trend, I decided to focus on the more important factor of prevention. I took all of the cold and sinus, cold and flu, allergies, serums and antidotes and put them in a plastic container and placed them in another bathroom cabinet. Then I filled the empty space with vitamins instead. I can't tell you how much better I felt about looking inside my cabinet. It felt like a weight had been lifted when I was focusing, not on when I am sick, but on my everyday health. 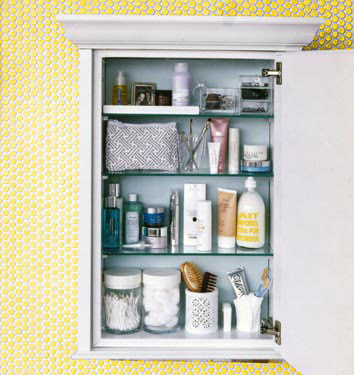 So, keep in mind that your medicine cabinet should not only be filled with the items you use everyday, but things you want to incorporate into your everyday routine as well. 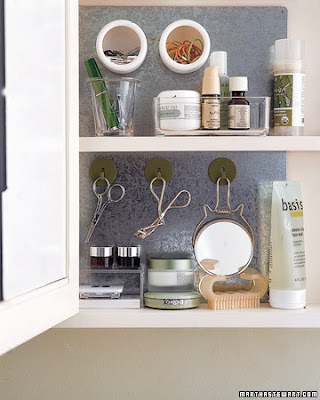 Below are a few exemplary medicine cabinets that will hopefully inspire the organizer in you as well as a few products that will help you get your cabinet in tip top shape. 1. Start by removing everything from your medicine cabinet. As you take each item out, check the expiration date. If it has expired, dispose of it properly. (The best way to dispose of medicine is to mix it with coffee grounds, cat litter, or sawdust in a zippered plastic bag and throw it out with the garbage. This will keep them away from kids and pets and prevent harm to fish and other wildlife habitats. Highly addictive drugs, which the food and drug administration classify as controlled substances should be flushed to eliminate any chance of accidental ingestion. Visit smarxtdisposal.net for a full list. Another options is to participate in a medication take-back program. To find out if your area has one and which medications it accepts, contact the local waste-management office at your city hall.) Sort and organize anything that hasn’t expired into piles based on what they are used for – pain medicines together, first aid essentials in another pile, and so on. 2. Look at your piles and evaluate what you need to re-stock. It's smart to have products for each of the following categories: Pain and fever, allergies, digestive issues, cuts and burns, and sunscreen. 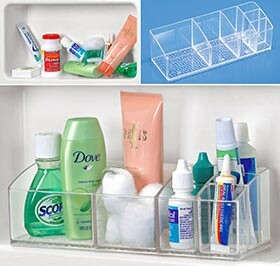 For a complete list of what you should stock see the Medicine Cabinet Essentials Checklist and the First Aid Essentials Checklist. Purchase anything that you are missing. 3. Final step: Wipe down the shelves and start putting everything away. 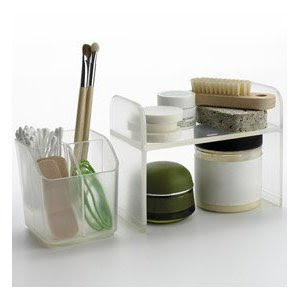 The key to an organized cabinet is to group items you use together and nestle them in small, unbreakable containers. 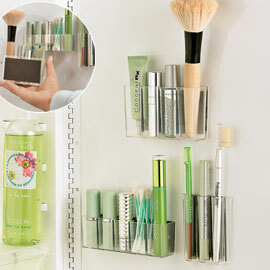 (Empty plastic beauty product jars work well, too.) Put products that you reach for most frequently front and center and place medicines on higher shelves out of reach of little hands.